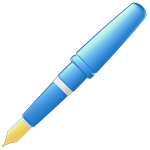 I had previously found Keynote Objects from iPresentee (file is a Mac only archive). This is a set of 100 attractive icons, and unlike many icon sets I’ve seen, there are many suitable for representing activities in the classroom. The pen pictured is half size. All the icons are in TIF format with a transparent background, and the icons are semi-transparent. I should note that I wrote this post back in January, but didn’t post it because I hadn’t actually started using these icons in my classroom and… that’s not changed. But I attended a training course today on using SMART Notebook and thought again about the consistent use of icons to help prompt students. Updated: When I posted this, I didn’t realise that the download was a Apple Mac only archive. Sorry about that.